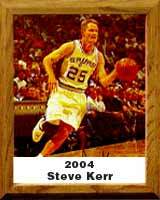 Few University of Arizona basketball players have had the impact of Steve Kerr. A graduate of Palisades High School in California (1979-83), Steve was not recruited out of high school and had an average career. It was Coach Lute Olson of the Arizona Wildcats who saw potential in Steve and he played for Olson from 1983-88. During that time he was named MVP of the first Fiesta Bowl Classic, earned All-American honors and ended his UA career with an NCAA record of .573 three-point shooting percentage. He remains in the top 10 Wildcat career performers with his .551 field goal percentage and .815 free throw percentage. His #25 jersey is now retired and hangs from the rafters at McKale Center. Steve overcame a lot of personal tragedy in his life. As a teenager his father was murdered in the Mid-East where he was teaching, and a few years later, while at the UA, he suffered a potential career-ending knee injury.